(Newser) – Andy Murray is still hoping to make it to one more Wimbledon tournament before his problematic hip forces him into retirement. For now, he's only committing to the Australian Open. 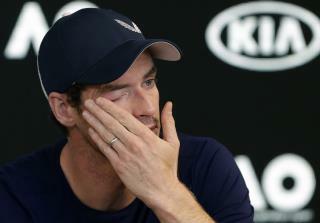 In an emotional news conference Friday, when a tearful Murray had to leave the room shortly after his first attempt to get it started, and needed to pause several times to compose himself once it had resumed, he confirmed he'd play his first-round match at the Australian Open next week but wasn't sure how much longer he could continue beyond that, the AP reports. The 31-year-old Murray said he practiced in the off-season with the main goal of making one last run at Wimbledon, where he ended the 77-year drought for British men with his title in 2013, but now wasn't sure he'd make it that far. "I can still play to a level—not a level I'm happy playing at," he said. "But also, it's not just that. The pain is too much really. I don't want to continue playing that way. I tried pretty much everything that I could to get it right—that hasn't worked." The three-time Grand Slam champion is scheduled to open against No. 22-ranked Roberto Bautista Agut at Melbourne Park, where the season-opening major begins Monday. He has reached the final five times at the Australian Open but never won the title. Getting through the first round will be a major achievement in 2019 for the former No. 1-ranked Murray, who has slumped to No. 230 after playing just 12 matches last year following surgery on his right hip in January. Get a grip Andy, there are others much more disabled and unfortunate than you. Man up to find another career to do. If you can’t do it, you can’t do it. Just go ahead and retire. Don’t tear your body up more. "77-year drought for British men with his title in 2013." The Brits won't win anything, in any sport for another 150 years, because they are a bunch of nothing losers. Homo's just like this guy. Worse than the French.